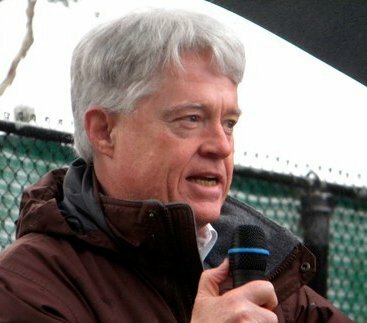 The most popular class ever, at Yale University, is a class on "happiness." The formal title of the class is, "Psychology and the Good Life," with the class being listed in the catalogue as Psyc 157. Click this link to read all about it. Because the class size mushroomed, as word of mouth drove enrollment, the class location was shifted, to accommodate the crowds. 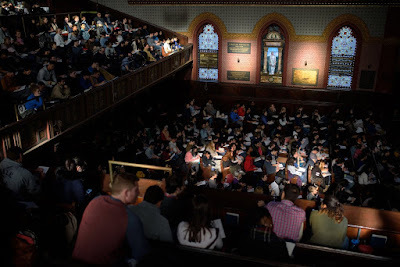 At the start, students had several different locations at which they could congregate, including the venue shown above, Battell Chapel, an historic place of worship on campus, converted to a lecture hall. Some might think this location rather appropriate, since it used to be religion, not courses in psychology, that gave us guidance on how to live the "good life." The course ultimately left religious influences behind, however, and is now taught in Woolsey Hall, usually the site of events like symphony performances, which can accommodate the entire class. The course focuses both on positive psychology — the characteristics that allow humans to flourish — and behavioral change, or how to live by those lessons in real life. Students must take quizzes, complete a midterm exam, and, as their final assessment, conduct a ... “Hack Yo’Self Project,” a personal self-improvement project. If you aren't able to get into Yale, don't despair; "happiness" may still be within your grasp. According to Dr. Laurie Santos, who teaches the course, "a multipart seminar-style series on the course material — filmed last year in her home, and titled, “The Science of Well-Being” — will soon be available for free on Coursera, an online education platform." If you're really old-school, of course, houses of worship are also open for business!